In a city as old as Philadelphia, it says a lot when a neighborhood is deemed of particular historical significance by the city’s citizens. One such stretch in the City of Brotherly Love is Jewelers Row, a block-long concentration of retailers known for being the nation’s oldest (and second-largest) diamond district. 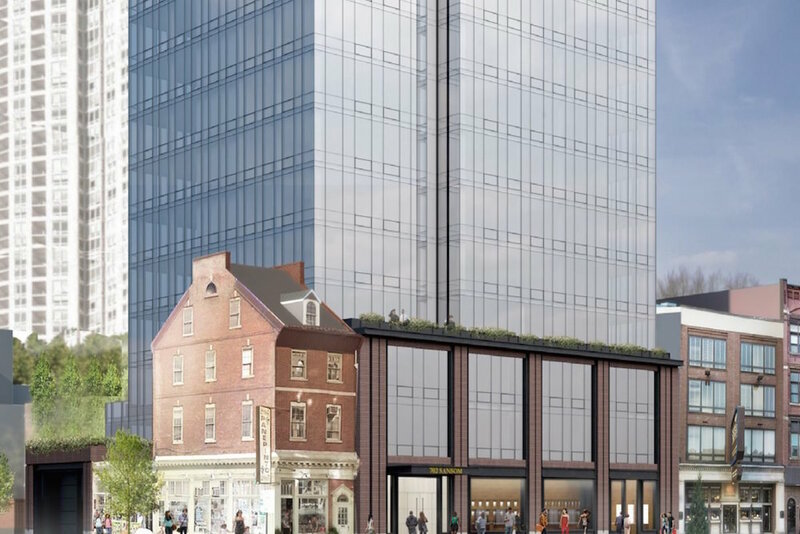 So when Philly ‘burb–based developer Toll Brothers proposed a 29-story residential tower that would require demolishing a handful of Sansom Street buildings, it’s no surprise that some in the city fought back. Now, after the latest version of the proposed project was unveiled by SLCE Architects for Toll Brothers, Pulitzer Prize–winning Philadelphia Inquirer architecture critic Inga Saffron is weighing in on the tower’s latest iteration, deriding the building as an “architectural zombie.” But that’s not the only target of her criticism; Saffron also places some of the blame for its blandness on the city’s Civic Design Board. 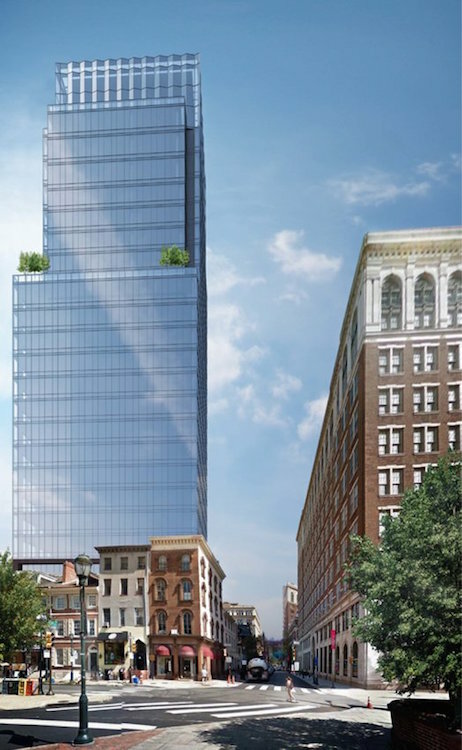 The most recent renderings show an anodyne 24-story glass tower with a series of simple setbacks rising above the brick-lined street. Beyond the incongruity of the design, Saffron calls out the project as a missed opportunity for architectural expression. She places the blame not only on SLCE and Toll Brothers, but also on the city’s Civic Design Board, which was founded in 2011 ostensibly to raise the city’s level of architectural design by vetting all large projects. The problem, she suggests, is that the board can’t outright veto a poor building, leaving developers the ability to apply again and again with simple concessions rather than innovative reimagining. 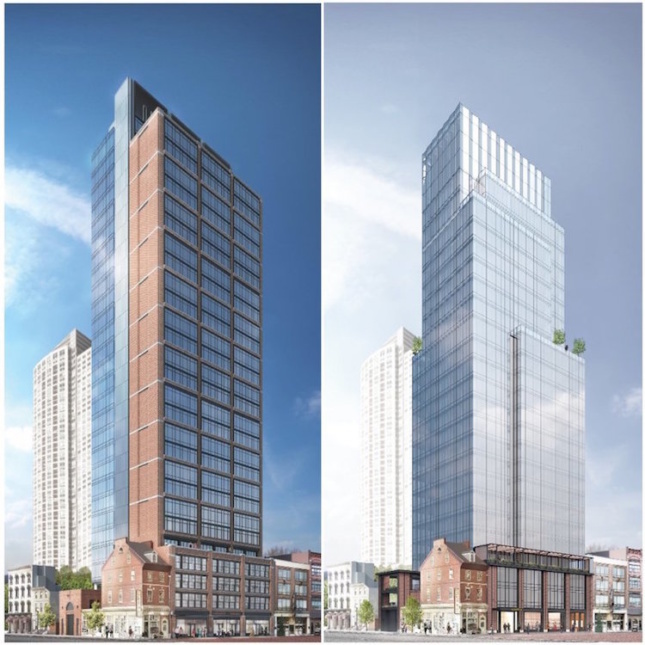 In the case of the Jewelers Row project, earlier versions of the plan included the use of brick to reference the surrounding buildings, an idea that was scrapped after community feedback that the design overwhelmed the neighborhood. A subsequent plan showed an all-glass face with a pleated crown, but a row of third-floor verandas proved too controversial, leading to their removal a month later in the most recent iteration. “That’s how public relations works,” Saffron says of the process, “not architectural design.” And that, she argues, is the problem.